Standard fitting for shower hoses. 3 shower modes. 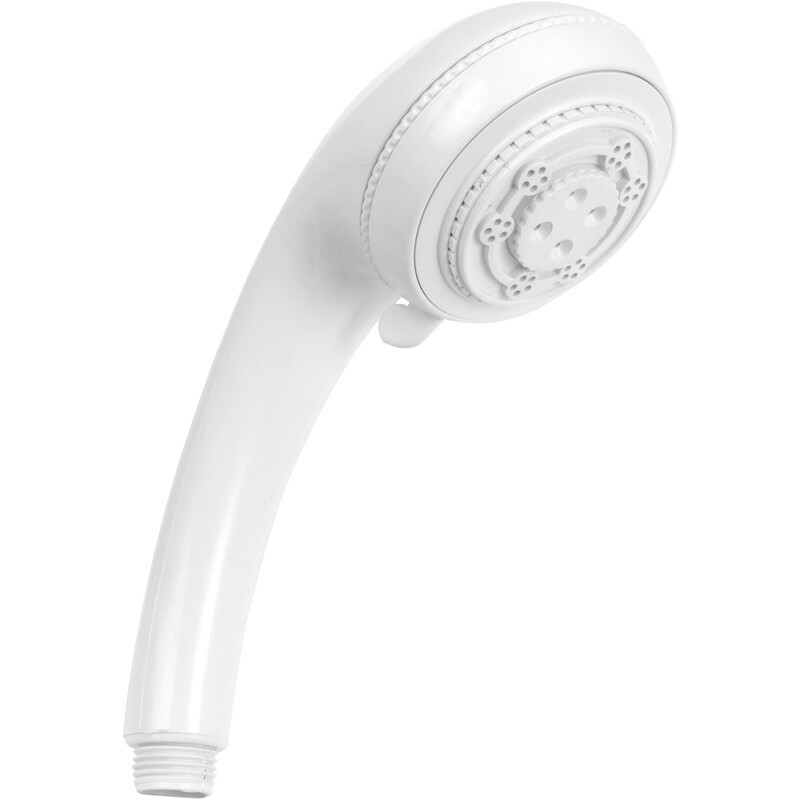 Multi Mode Rub Clean Shower Handset White is rated 4.1 out of 5 by 7. Rated 5 out of 5 by jimbo53 from Does the job, great price Fitted this to a gravity feed shower despite the reviews and it works fine. 5 spray modes are useful and hopefully one of them will suit my fussy family when they next visit. The only drawback is the angle of the head. On our shower it won't tilt far enough to spray anything like vertically down. Not quite horizontal but at a good angle. Rated 2 out of 5 by Mark2345 from Superb Value As the title says, a great value item. Rated 5 out of 5 by Jeff46 from Great for the price. A very good product for the price paid. Rated 5 out of 5 by Willie from No Nonsense Easy to assemble, multi function use and good value for money. Rated 4 out of 5 by shirts_w from Good value One of the cheapest shower heads available but quality of manufacturer and finish is good. We have used it together with white hose 33817 for a few weeks now and it works fine. The spray holes are rubber and the instructions say to rub the rubber with your thumb to clean it, I guess the idea is to dislodge any build up of limescale. The shower head cannot be taken apart for cleaning. Happy with this item and would buy it again when needed.